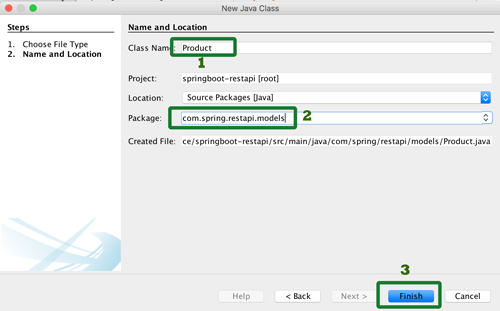 A comprehensive step by step tutorial on how to build Java REST API or RESTful web service using the latest Spring Boot and MongoDB. REST API is today's requirements for Mobile Apps, Web Application or Desktop Application that need to connect with Database. That's why we need to create a step by step tutorial of building Java REST API server using Spring Boot and MongoDB. The data store in MongoDB server and accessible everywhere via Java REST API. Previously, we have to create REST API in different technology and framework using Grails and Node.js. Now, we are using Spring Boot for it. After all, you can compare which technology or framework that fits your needs. We assume that you have installed JDK 8, Gradle and IDE (Netbeans, Eclipse, STS or IntellijIdea). Next, we will create a new Spring Boot Gradle project using Spring Initializer. 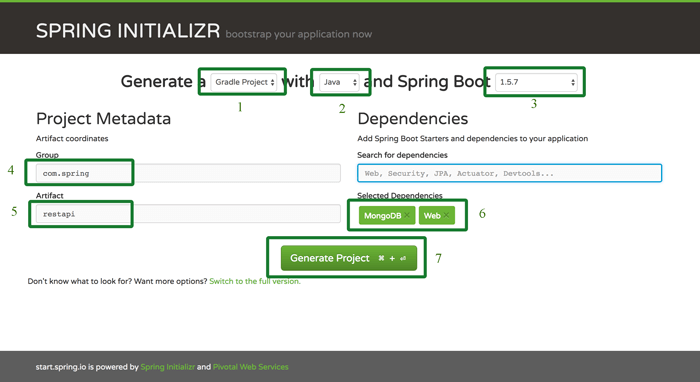 Just go to Spring Initializr web-based Spring project generator then fill the required frameworks and libraries. Open another terminal then run MongoDB server. In current terminal go to the newly extracted Spring Boot project folder then type this command to compile the application. Open and edit `src/resources/application.properties` then add this lines of strings. We are not accessing directly to MongoDB collections and fields but we have to access it via Java Object. For that, we have to create a new Java Class as a model or entity. If you are using Netbeans (similar with some IDE), right-click project name then click `New` then click `Java Class`. Fill necessary fields like above screenshot then click Finish button. Netbeans will automatically open the newly created file, replace all codes with this. That product Class mapping to products collections of MongoDB which has 5 fields (id, prodName, prodDesc, prodPrice, prodImage). Each field has a getter and setter. Now, we need to create an interface for connecting Product model and controller. On Netbeans right-click project name on projects left panel then choose `New` then choose `Java Interface`. Fill necessary fields like above screenshot then click Finish button. 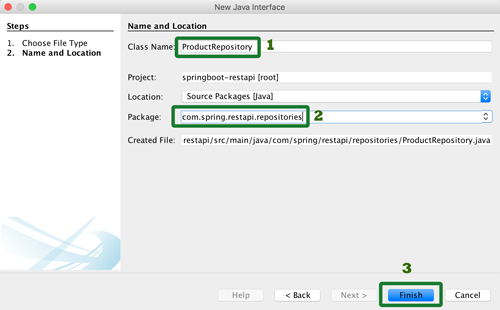 Netbeans will automatically open the new `ProductRepository.java` interface file. Replace all codes with this. Now, it's a time for RESTful Web Service (REST API) implementation by creating a new RESTful controller file. On the Netbeans right-click project name then click `New` then click `Java Class` again. Fill necessary fields like above screenshot then click Finish button. Netbeans will automatically open the new `ProductController.java` class file. Replace all codes with this. For testing purpose, we use curl from terminal or command line. Let's start the server by type this command. Open another terminal tab then type this command for post data to REST API. You will see the successful response like this. To get all product data type this command. You will see all data as JSON array like this. To get single data, type this command. You will see the single object of JSON data. To update the specific data by ID type this command. You will see this response on successful update. To delete specific data by ID, type this command. You will see this response if successful delete. That it's, the simple way to create Java RESTful web service or REST API using Spring Boot and MongoDB. You can find the full source code on our GitHub.